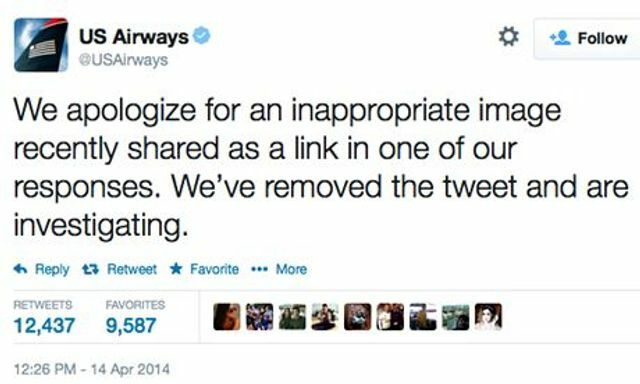 The American airline tweeted the explicit image to an unhappy customer by mistake – but it took the firm nearly an hour to remove the post. The pornographic image, which depicted a naked women and a model plane, was included in a response to a customer who complained about her delayed flight from North Carolina to Oregon. The picture was accompanied by the message: "We welcome feedback, Elle. If your travel is complete, you can detail here for review and follow up." Big thanks to @USAirways for finally giving us a satisfying ending to LOST. Either someone at US Airways is terrible at doing their job or incredible at quitting their job.